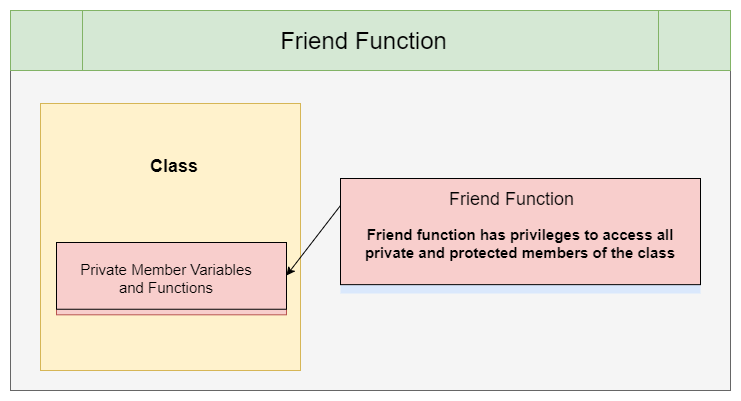 Friend function has privileges to access all private and protected members (variables and functions) of the Class. According to the data hiding concept in C++, no one has the permission to access private and protected members from outside the class. If a developer needs access to the private or protected members, then the developer can use friend functions. A friend function provides privileges to access all the private and protected members of the class. If a function is friend function of a class, then the friend function is not the actual member of the class. But that friend function has rights to access to all private and protected members (variables and functions). The friend function is not in class scope. It should be declared inside the class with ‘friend’ keyword. It can be defined anywhere in the program and outside of the class like a normal function. But friend keyword must not be used in the function definition. It is not in class scope. So it cannot be called by objects of the class. It can be called like a normal function. Usually, it has class objects as arguments. It cannot access member variables or functions directly, but can only be accessed by the help of the objects of the class. It can be declared with any access specifier and the access specifier does not have any impact on the friend function.